Dec. 18, 2015 2:00 p.m.
Crews work to prepare the homeless shelter for its opening on Monday. 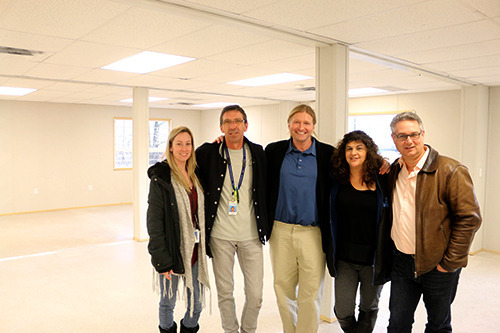 The trailers are on site, the staff are ready, and only a few more finishing touches are needed before the 40-bed temporary homeless shelter on Riverside Road opens on Dec. 21. The $1.2 million project will be run by the non-profit Lookout Emergency Aid Society. Shayne Williams, executive director of Lookout, says they hope to open the doors early that afternoon. “If you’ve been sleeping rough or out there in the weather right now, you’ll need a lot of rest and some food. Once you get some food in your belly and your basic needs are met, opportunities open up in your mind,” said Williams. He says the facility is “precedent-setting” because of its service provider offices, which will allow representatives from various organizations to work with clients directly at the site. The shelter will offer three meals a day and a daytime drop-in centre, and it will operate until the end of April.